Each of our flavors will have an associated color. The colored husks on the front of our packages will be the first thing that the customer will see. The goal is to make each flavor visually distinct without writing it out in 80 point font. I am a HUGE stickler for color. That makes this decision really tough, plus Coulter and I don’st really see eye to eye on color either. We are probably going to have to battle this one out! This afternoon I went through our Pantone Color book and tore out colors that really grabbed my attention. 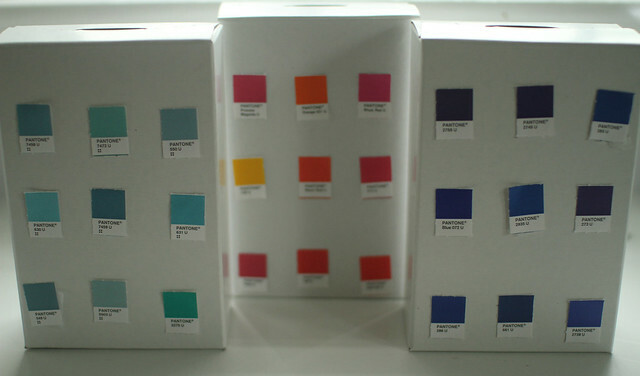 We want exact colors, and we don’st have room for error, therefore we need to pick a Pantone color. The printer will print the exact shade, tone, hue of the pantone color that we choose…every time we go to print. Therefore our colored husks will be consistent, which is what we want. My high standards are written below… I am probably being overly aggressive about this, but I honestly can’st help it. 1. The colors need to stand out from the rest of the popcorn boxes. I really don’st want to use yellow or orange for this reason. 2. The colors need to be bright enough so your eye goes to them. Since microwave popcorn most often lives on the bottom shelf it needs to pop! 3. The colors need to be fun, friendly, inviting, but not too in your face. 4. The colors need to be clean. Not too flourecent, not too loud, not too artificial looking! After all, our product is pure, and we want our colors to convey that message. Please let us know what colors you want to see on the shelves! We need the feedback! It’ss not as easy as one would think.